Initially developed to replace discrete capacitors, resistors and inductors, integrated passive devices (IPDs) are having a kind of resurgence thanks to the development of ever-shrinking electronic devices that need to pack more electronics components into smaller spaces. These newer devices are far from simple capacitor and resistor arrays. Today, IPDs can reduce an OEM’s bill of materials; save board space, and deliver performance advantages at a price point comparable to or better than discrete devices in some cases. “IPDs provide ideal electrical responses, minimized size and weight, and the highest reliability that’s possible given the function of the part,” said Ron Demcko, AVX Fellow, AVX Corp. There are also some very cost-competitive standard parts, he added. Demcko also notes that in the GHz-frequency range, IPDs are starting to show cost and time-to-market advantages compared with individual device solutions. Revenue in the IPD market exceeded $750 million in 2017 and is forecast to surpass $1 billion by 2022, according to market research firm Yole Développement (Yole). IPD growth is driven by automotive, consumer, healthcare, smart wearables and high-end communications applications, Demcko said. Of those, smart wearables -- that have size and performance requirements – represent the highest demand, he added. 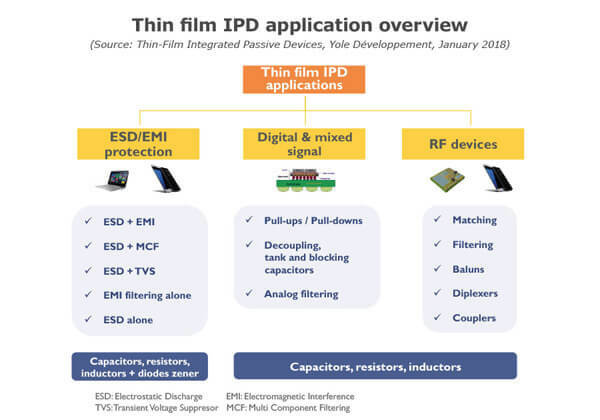 The Yole Thin-Film Integrated Passive Devices report finds the need for miniaturization and integration are driving demand and continued growth. “The thin-film IPD process offers finer pitch feature, better tolerance control, higher flexibility, and packages possessing higher integration than other commonly available technologies, i.e. PCB and LTCC technologies,” according to Yole. New opportunities are opening up driven by miniaturization, higher performance and lower cost, according to Yole’s technology and market analyst Amandine Pizzagalli. The primary applications for IPDs are electrostatic discharge (ESD) and electromagnetic interference (EMI) protection, followed by RF front-end modules that use devices such as IPD baluns and diplexers. Yole said the ESD/EMI IPD segment accounts for more than 60 percent of the total IPD market as of 2017. Currently, consumer applications, particularly smartphones, are the big consumers of IPDs in RF front-end modules or for ESD/EMI protection, said Yole. The biggest benefits include miniaturization, low cost, and high-value precision. An emerging market is digital and mixed-signal IPDs, where integration density and miniaturization are the key priorities, but the volumes are still very low, said Yole. Initial homes cited for digital mixed-signal IPDs are decoupling applications in smartphone processors and medical applications that require miniaturization and high capacitance density. One of the key reasons for widespread adoption of ESD/EMI and even RF IPDs is standardization. In the world of transient suppression and EMI protection and the IPD balun (RF), these components are already standardized and multi-sourced, said Demcko. For EMI protection, standardization is based on application voltages, and RF standardization is based on the frequency band of use such as WiFi, GPS, WLAN, etc., he added. Demcko said mixed technology IPDs are most applicable to medical and instrumentation applications rather than consumer and automotive. Although silicon remains the mainstream substrate material for IPDs, Yole finds there are alterative materials disrupting its dominance, particularly in RF IPDs, due to silicon’s limitations in insertion loss and dielectric loss. Other substrate materials being evaluated include glass and GaAs. Yole notes the new 3D technology has opened up new application opportunities. An example cited is Apple’s iPhone 7 and A10 processor that integrates several silicon-trench capacitors under the microprocessor’s bumps. 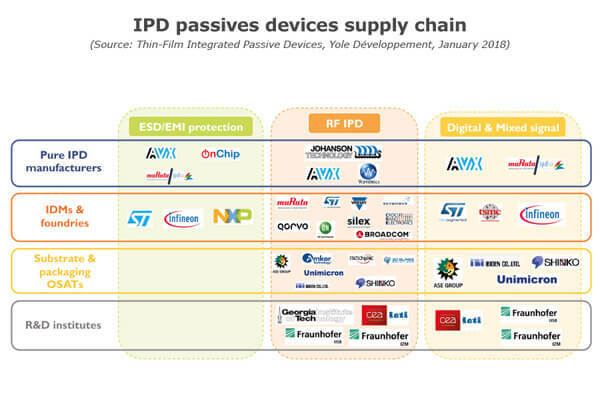 Players in the IPD market include pure-play manufacturers such as AVX, Murata/IPDiA, and Johanson Technology, integrated device manufacturers (IDMs) & foundries including STMicroelectronics, NXP and Infineon, and substrate and packaging outsourced semiconductor assembly and testing suppliers (OSATs). Pure players are driving the adoption of IPD solutions. “These solutions must convince customers that they are vital for implementing passives in their integration. In order for this to happen, IPDs must be seen either as an easily-outsourceable commodity or as a differentiator justifying new supplies,” said Yole. Yole finds that IDMs/foundries use IPDs as an added value for their products and offer them as an option to customers, whereas OSATs implement IPDs upon customer request. OSAT solutions are typically more standardized parts or are supplied by pure players to integrate into packages. Gina Roos is executive editor of EPS News. She can be reached at gina.roos@epsnewsonline.com.